علی‌نژاد, علیرضا, امینی, امیر, میرطالب, سید حامد. (1395). طراحی آماری- اقتصادی نمودار کنترل np با استفاده از بهینه‌سازی چند‌هدفه و DEA با مقادیر خاکستری. نشریه علمی پژوهشی مهندسی و مدیریت کیفیت, 6(3), 168-179. علیرضا علی‌نژاد; امیر امینی; سید حامد میرطالب. "طراحی آماری- اقتصادی نمودار کنترل np با استفاده از بهینه‌سازی چند‌هدفه و DEA با مقادیر خاکستری". نشریه علمی پژوهشی مهندسی و مدیریت کیفیت, 6, 3, 1395, 168-179. علی‌نژاد, علیرضا, امینی, امیر, میرطالب, سید حامد. (1395). 'طراحی آماری- اقتصادی نمودار کنترل np با استفاده از بهینه‌سازی چند‌هدفه و DEA با مقادیر خاکستری', نشریه علمی پژوهشی مهندسی و مدیریت کیفیت, 6(3), pp. 168-179. علی‌نژاد, علیرضا, امینی, امیر, میرطالب, سید حامد. طراحی آماری- اقتصادی نمودار کنترل np با استفاده از بهینه‌سازی چند‌هدفه و DEA با مقادیر خاکستری. نشریه علمی پژوهشی مهندسی و مدیریت کیفیت, 1395; 6(3): 168-179. روش‌های کنترل کیفی آماری، اساس سنجش عملکرد و بهره‌وری فرآیند می‌باشند. نمودارهای کنترل از پرکاربردترین ابزارهای کنترل آماری بوده و نقش مهمی در ارتقا کیفیت فرآیندها و محصولات ایفا می­کنند. اصلی­ترین هدف پیاده­سازی آنها شناسایی انحراف(ها) و انجام اقدامات اصلاحی برای رفع ریشه انحراف است. کاربردهای فنی نمودارهای کنترل تعیین اندازه نمونه، فرکانس نمونه‌گیری و حدود کنترل می‌باشد که به آن طراحی نمودار کنترل اطلاق می‌شود. در بیشتر تحقیقات انجام شده برای طراحی نمودار nP ، فقط یک انحراف بادلیل را به عنوان عامل از کنترل خارج شدن نمودار درنظرگرفته­اند درحالی­که چندین انحراف در صنعت می‌توانند نقش داشته باشند. بدین منظور در این تحقیق به طراحی و توسعه آماری-اقتصادی نمودار کنترل nP، بمنظور کاهش هزینه‌ها و متوسط زمان شناسایی و افزایش توان نمودار با استفاده از مقادیر خاکستری و درنظرگرفتن انحرافات بادلیل متعدد پرداخته شده است. در این راستا بمنظور دستیابی به مقادیر بهینه این پارامترها، یک مسئله چندهدفه با سه محدودیت تعریف شده است که هر ترکیب ممکن از پارامترها را به عنوان یک واحد تصمیم‌گیری درنظر گرفته ایم. سپس با استفاده از روش تحلیل پوششی داده­ها و روش­های رتبه بندی،کاراترین طرح برای تصمیم گیرنده تعیین شده است. در ادامه تحقیق تحلیل حساسیت بر روی برخی پارامترهای مدل انجام شده است و تاثیر این پارامترها بر روی مقادیر بهینه مورد تجزیه و تحلیل قرار گرفته است. Burr, J.T. (2005). Elementary Statistical Quality Control. New York. Marcel Dekker. Shewhart, W. A. (1926). Quality Control Charts. Bell System Technical Journal, 5 (4), 593-603. بامنی مقدم، م. (1384). کنترل کیفیت آماری، انتشارت دانشگاه پیام نور، تهران. Kaya, İ. (2009). A genetic algorithm approach to determine the sample size for attribute control charts, Information Sciences, 179 (10), 1552–1566. Chen, Y.K., Chang. H.H.,&Chiu. F.R. (2008). Optimization design of control charts based on minimax decision criterion and fuzzy process shifts. Expert Systems with Applications, 35, 207–213. Duncan, A. J. (1956). The economic design of X charts used to maintain current control of a process. Journal of American Statistical Association, 51, 228–242. Duncan, A.J. (1971). The economic design of x charts when there is a multiplicity of assignable causes, Journal of the American Statistical Association, 66 (333), 107-121. Gibra, I. N. (1971). Economically Optimal Determination of the Parameters of control charts. Management Science, 17, 635-646. Gibra, I.N. (1975). Recent development in control chart techniques, J. Qual. Technol., 7, 183–192. Chiu, W. (1975). Economic design of attribute control charts. Technometrics, 17(1), 81-87. Chiu, W.(1976). Economic design of nP charts for processes subject to a multiplicity of assignable causes, Management Science, 23(4), 404-411. Govil, A.K. (1983).Reliability Engineering, TaTa McGraw – Hillpublishing company limited, New Delhi. Taylor J.K., & Oppermann, H.V. (1986). Handbook for the quality assurance ofmetrological measurements. National Bureau of Standards Handbook, 145. Taylor, J.K. (1987). Quality Assurance of Chemical Measurements. Lewis Publishers, Chelsea, 328. Taylor, J.K. (1990). Statistical Techniques for Data Analysis, Lewis Publishers, Boca Raton, FL, 1990. Duncan, A. J. (1978). The economic design of p-charts to maintain current control of o process: Some numerical results. Technimetrics, 20(3), 235-243. Saniga, E. (1989). Economic statistical control chart designs with an application to and R charts, Technometrics, 31, 313-320. Wang, R.C., Chen, C.H. (1993). Economic statistical np-control chary designs based on fuzzy optimization. International Journal of Quality & Reliability Management, 12 (1), 82-92. Woodall, W. H. (1997). Control Charting Based on Attribute Data: Bibliography and Review, Journal of Quality Technology, 29(2), 172-183. Montgomery, D.C. (1982). Computer programs – economic design of an x-control chart. J Qual. Technol, 14(1), 40–43. Gibra, Isaac M. (1981). Economic design of attribute charts for multiple assignable courses. Journal of Quality Technology, 13(2), 93-99. Lorenzen, T.J., &Vance, L.C. (1986). The economic design of control charts: a unified approach. Technometrics, 28(1), 3-10. Woodall, W.H. (1986). Weaknesses of the economic design of control charts, Techno-Metrics, 28, 408–410. Rahim, M.A., &Banerjee, P.K. (1993). A generalized model for the economic design of ¯ X control charts for production systems with increasing failure rate and early replacement, Nav. Res. Logist., 40, 787–809. Al-Oraini, H.A., &Rahim, M.A. (2002). Economic statistical design of X¯ control charts for systems with Gamma (λ, 2) in-control times, J. Comput. Ind. Eng., 43, 645–654. Chen, Y. K. & Liao, H. C. (2004). Multi-criteria design of an x̄ control chart. Computers & Industrial Engineering. 46(4), 877-891. Guo, R., & Dunne, T. (2006). Grey predictive control charts, Communications in Statistics. Theory and Methods, 35, 1857-1868. Guo, R., Thoutou, S.M., & Dunne, T. (2007). Economic design for random fuzzy variable quality control charts. Proceedings of the 5th International Conference on Quality and Reliability, 5-7. Kaya, I. (2009). A genetic algorithm approach to determine the sample size for control charts with variables and attributes. Expert Systems with Applications, 179(10), 1552–1566. Asadzadeh, S., & Khoshalhan, F. (2009). Multiple-objective design of an X¯ control chart with multiple assignable causes, Int. J. Adv. Manuf. Technol., 43, 312–322. Niaki, S.A., Ershadi, M.J., & Malaki, M. (2010). Economic and economic-statistical designs of MEWMA control charts—a hybrid Taguchi loss, Markov chain, and genetic algorithm approach. The International Journal of Advanced Manufacturing Technology, 48 (1–4), 283–296. Bashiri, M., Amiri, A., Doroudyan, M.H., Asgari, A. (2012). Multi-objective genetic algorithm for economic statistical design of X control chart. Sciatica Iranica E, 20(3), 909-918. Bashiri, M., Amiri, A., Asgari, A., & Doroudian, M. H. (2012). Multi-objective Efficient Design of np Control Chart Using Data Envelopment Analysis. IJE TRANSACTIONS C, 26(6), 621-630. Sherbaf Moghaddam, A., Amiri, A., Bashiri., M. (2014). Multi-objective Economic-Statistical Design of Cumulative Count of Conforming Control Chart. IJE TRANSACTIONS A, 27 (10), 1591-1600. Najafi, E. (2014). Efficient Selection of Design Parameters in Multi-Objective Economic-Statistical Model of Attribute C Control Chart. Int. J. Data Envelopment Analysis, 2 (2), 357-367. Amiri, A., Jafarian- Namin, S. (2015). Evaluating multi-objective economic-statistical design of attribute C control charts for monitoring the number of non-conformities. International Journal of Quality Engineering and Technology.5(2). Mirhoseini, S.A. (2010). Data Envelopment Analysis, Models and Applications, Amirkabir University of Technology Press, (Translated in Persian). Horri, M. S., &Saeedinia, M.A. (2008). Evaluating the Relative Efficiency and Ranking of Teaching Hospitals of Medical School in Diagnostic Departments by DEA/AHP approach, journal of strategic management studies- JSMS, 40 (15), 370-388. Safari, S. Azar, A. (2004). 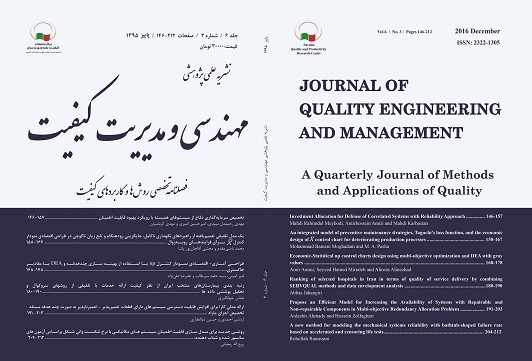 Evaluation Performance of Organization Based on Quality Awards Indicators DEA Approach, Danehsvar Magazine, Shahed University Press,11(8), 1-14. Jyoti, andBanwet, D.K., &Deshmukh, S.G. (2008). Evaluating performance of national R & D organizations using integrated DEA-AHP technique, International Journal of Productivity and Performance Management, 57(5), 370-380. Charnes, A., Cooper, W. W. & Rhodes, E. (1978). Measuring the efficiency of decision making units, European Journal of Operational Research, 2(6), 429-444. Wang, J., &Yang, L. (2009). Polynomial spline confidence bands for regression curves, Statistical Sinica, 19, 325-342. Wang, J. L., Chiou, J.M., & Muller, H.G. (2015). Review of functional data analysis, Annu. Rev. Statist., 1-41. Yu, F.J., Hou, J.L. (2006). Optimization of design parameters for control charts with multiple assignable cause. J Appl Stat 33 (3), 279–290.